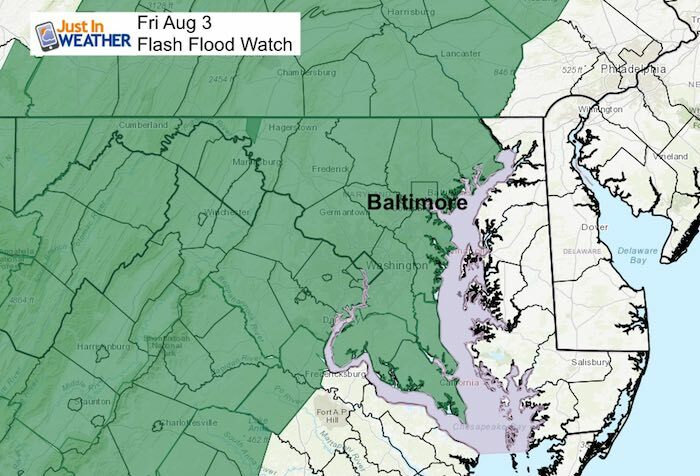 Another Flash Flood Watch has been issued for today though tonight. Any additional rain can lead to flooding as we have soggy soil and swollen waterways. The storms that developed on Thursday were more intense and shifted farther east than the models had indicated. The net result was over 3 inches of rain in parts of Anne Arundel County. The official Baltimore weather report from BWI was only 0.28″, yet the monthly total of 0.54″ has us above average again. Today should keep that trend, but we will improve this weekend and week. This is better news for our Maryland Trek team, but we are not completely done with the rain. Next week will turn hot, humid, and bring typical afternoon storms we expect in August. Note: Like the past few days, we should see more activity than shown here. Hey downpours will lead to local flooding and a slight risk they turn severe. This animation shows Saturday with rain on the Eastern Shore, but dry for the western half of Maryland. That is good news for many of us, including our Maryland Trek Team as we being our week long journey from Wisp on Sunday. We all dry out Sunday, but then it will turn hot. We should reach the lower 90s from Sunday to many days next week with afternoon storms. Overall, typical August weather retuning, but better than what wee have had.